A screen room can be a wonderful upgrade for your home in the Pensacola, Florida, area. One of these enclosures can maximize the overall living space of your home, providing an area for you and your family to enjoy your beautiful backyard while being protected from pesky insects, harmful UV rays, and inclement weather. And, when you need a screen room installation at your home, turn to Majors Home Improvement, a local, family-owned business that has been providing homeowners in the area with precise installations, quality products, and personalized customer service for many years. When you hire Majors Home Improvement, you can trust that your screened enclosure will be expertly and efficiently installed at your home in Pensacola. Our installers are highly trained and adhere to the strictest installation procedures. What’s more, you’ll have excellent protection for your investment in the form of a warranty on both the parts and the labor. 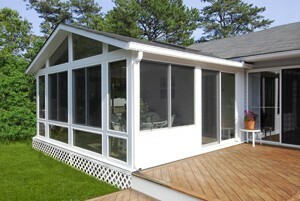 Contact Majors Home Improvement today to learn more about our screen room products and installation services. We’re proud to serve homeowners in Pensacola, FL, and all surrounding cities.